WebGL has some additional options in the Player settings (menu: Edit ^gt; Project Settings, then select the Player category). Open Publishing Settings to access the Memory Size field. Here, you can specify how much memory (in MB) the content should allocate for its heap. If this value is too low, an “out of memory” error message appears. This means your loaded content and Scenes cannot fit into the available memory. However if this value is too high, your content might fail to load in some browsers or on some machines, because the browser might not have enough available memory to allocate the requested heap size. This value is written to a property named TOTAL_MEMORY in the generated .json file, so if you want to experiment with this setting without having to rebuild your project, you can either edit the .json file or provide the updated TOTAL_MEMORY value as an additional WebGL instantiation parameter. See the User Manual page on WebGL memory usage for more details. Open the Player settings (menu: Edit > Project Settings, then select the Player category), open the Publishing Settings panel and set Enable Exceptions to None if you don’t need exceptions in your build. Open the Player settings (menu: Edit > Project Settings, then select the Player category), open the Other Settings panel, and enable Strip Engine Code to ensure an efficient build. 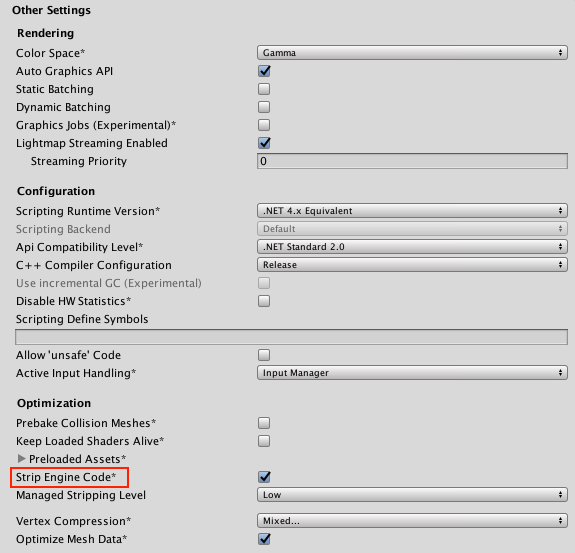 If you make a release build, Unity compresses the build output files according to the Compression Format selected in the Publishing Settings panel of the WebGL Player settings. 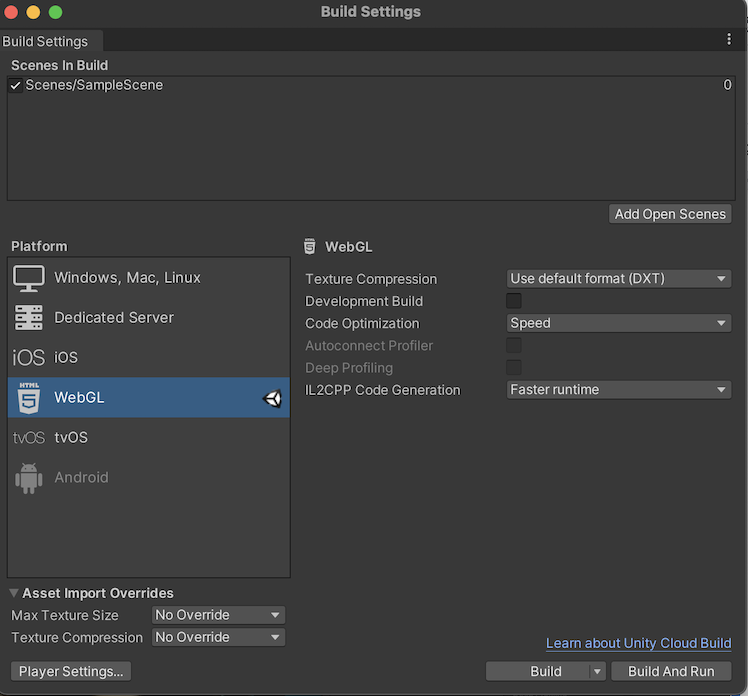 Unity removes all unused code from your build by default. You can change this via the Player settings (menu: Edit > Project Settings, then select the Player category): Select the Other Settings panel to access the Strip Engine Code option. It is better to build with stripping enabled.